Students from the Grand Canyon University Honors College took part in a six-week boot camp this semester — but not the kind with sprints, jumping jacks and weight training. This one included intensive mock interviewing, networking and professional training. And three — Zachary Merhavy, Connor Ensign and Abigail Perzan — of the 22 participants went the extra mile and were selected for a potential $3,000 scholarship to help cover tuition at GCU, renewable each year they are in college. The Personal Academic Career Boot Camp was a new effort launched by the Honors College in partnership with GCU’s Career Services department for students to meet with field experts and mentors while learning how to make the most out of their college careers outside the classroom. The boot camp required students to dedicate their personal time in workshops, conduct career research and meet one-on-one with professionals in their respective fields. “With college students, most of them get easily fixated on the academic portion, which is going to class, passing classes and focusing on GPA. But there are so many things that students need to do for the career field they have chosen outside of the classroom that they fail to recognize until their senior year or when they are walking across the stage at graduation,” said Breanna Naegeli, Honors College program manager. The first session focused on students researching their field of study, including average income and possible employers, Naegeli said. “We really wanted to home in on what students wanted to do long term and focus in on how to get them on that path,” she said. Career Services invites students to explore professional opportunities and resources with a wide range of workshops on interviewing skills, how-tos on delivering elevator speeches, and networking. Utilizing tools provided by Career Services, “P.A.C. Boot Camp” put a cohort of students through an extensive program in which they had the opportunity to invest in themselves in ways they didn’t know existed, Naegeli said. But what the students didn’t know was that there would be a scholarship award in the end. “The reason we didn’t tell them there would be a scholarship opportunity was because we didn’t want them to race for the money. With it being kept secret, we knew that students were doing it to really improve and better themselves,” Naegeli said. The finalists were selected for a potential scholarship based on a boot camp scorecard in which students tracked their participation and progress. Following each requirement, students could score at least 1,000 total points. In the end, Merhavy led with 2,775 points, followed by Ensign (2,195) and Perzan (1,675). 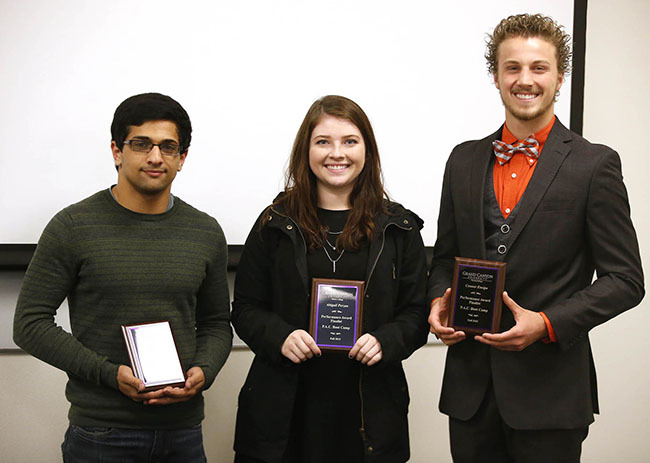 “They were doing things like going to guest speaker presentations, making sure to shake their hand after and asking for business cards — it was all about looking for resources and connections that could potentially help them reach their career goals,” Naegeli said. The finalists and their mentors received a plaque of recognition, and finalists will have the opportunity to interview with the GCU Executive Leadership Team for a potential scholarship. The winner will be announced before winter break. Merhavy, a first-year biology pre-med student, said he struggles with talking about himself but has learned that it shouldn’t embarrass him. Although the three finalists set serious goals and worked hard, Naegeli said it was no surprise to see Merhavy at the top of the scoring list. Merhavy said he initially hoped to gain as much knowledge as possible about his field. However, the biggest lesson he learned was that it is OK to point to about his accomplishments. Ensign, a sophomore majoring in Sports Management, is intent on turning his childhood passion into a career. But first, Ensign is ensuring that he learns to speak more strategically. Ensign got off to a good start at the beginning of boot camp when he scored one of the highest point totals in crafting and delivering an elevator speech. “It forced me to really have to think about who I am, all of my experiences, what I do and what I want to do in such a short amount of time,” Ensign said. Ensign said he has never struggled with casual conversation, but interviewing makes him a bit shaky. When she signed up for the boot camp, Perzan looked forward to having a mentor. And after six weeks of boot camp, the freshman Forensic Science major had high praise for Melissa Beddow, the mentor who helped her get an inside look at her chosen field. “We were constantly communicating and finding out the best resources for me,” Perzan said. After Beddow set her up with the right contacts, Perzan was able to visit several forensic laboratories in the Valley, she said. However, realizing her dream job made the experience even more special. “Before, I just knew that I wanted to work in the field of forensic science. But after touring all of these labs and getting to know the lab technicians, I know that I definitely want to be inside of a lab,” Perzan said.